The Sunday bird walk went to the Buttertubs Marsh in Nanaimo. The morning was sunny with cloudy periods. The highlight of the morning was hearing a Cassin’s Vireo singing continually from the top of a tree and catching glimpses as it moved. We also head a fledgling calling from the same area. 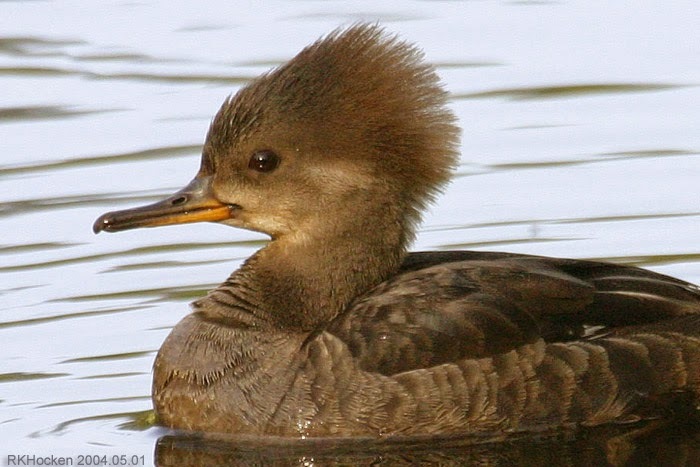 We spotted a Hooded Merganser catch a frog and struggle as he swallowed it. Canada Geese, Mallard, Wood Duck, Hooded Merganser, Pied-billed Grebe, Great Blue Heron, Bald Eagle, Turkey Vulture, Belted Kingfisher, American Coot, Merlin, Red-tailed Hawk, Band-tailed Pigeon, Northern Flicker, Anna’s Hummingbird, Steller’s Jay, Northwestern Crow, Common Raven, Cassin’s Vireo, Chestnut-backed Chickadee, Red-breasted Nuthatch, Marsh Wren, Brown-headed Cowbird, Western Tanager, Spotted Towhee, Song Sparrow, Dark-eyed Junco, Purple Finch, Red-winged Blackbird, American Goldfinch, House Finch and House Sparrow. A Barn Owl was seen along the Ugly Dwarf Meadows close to the Gas Station at the top of Nanoose Hill along Highway 19. The Tuesday bird walk on Tuesday September 02 will be going to the Shelly Road side of the Englishman River Estuary in Parksville. Meet at the Parksville Bay Community Park at the parking lot near the Lion’s Club playground at 9:00 a.m. or at the end of Shelly Road on the Oceanside of Highway 19a in Parksville at about 9:10 a.m. The Sunday bird walk on September 07, 2014 will be going to Neck Point Park in Nanaimo. Meet at the Bird Store at 9:00 a.m. or at the parking lot at Neck Point off Hammond Bay Road at about 9:20 a.m. The Sunday bird walk went to the Plummer Road side of the Englishman River Estuary in Parksville. The morning was sunny and warm. The highlight of the morning was a Merlin who entertained us as it chased a flock of European Starlings and spooked the shorebirds. We caught glimpses of a Lincoln’s Sparrow and two Orange-crowned Warblers just off the trail. There were Long-billed Dowitchers, Killdeer, Greater Yellowlegs, Western Sandpipers, Least Sandpipers, Semi-palmated Sandpipers and Semi-palmated Plovers feeding on the mud flats. We spotted a Common Loon on the Strait of Georgia. Canada Geese, Mallard, Northern Pintail, Green-winged Teal, Common Merganser, Pelagic Cormorant, Common Loon, Great Blue Heron, Bald Eagle, Merlin, Turkey Vulture, Black Oystercatcher, Long-billed Dowitcher, Killdeer, Greater Yellowlegs, Western Sandpiper, Least Sandpiper, Semi-palmated Sandpipers, Semi-palmated Plovers, Bonaparte's Gull, California Gull, Glaucous-winged Gull, Band-tailed Pigeon, Eurasian Collared Dove, Anna's Hummingbird, Belted Kingfisher, Northern Flicker, Northwestern Crow, Common Raven, Chestnut-backed Chickadee, Red-breasted Nuthatch, Bewick's Wren, American Robin, European Starling, Cedar Waxwing, Orange-crowned Warbler, Spotted Towhee, Lincoln’s Sparrow, Golden-crowned Sparrow, White-crowned Sparrow, House Finch and American Goldfinch. A Western Screech Owl was heard and seen along Morrell Circle in Nanaimo. Four Common Murre, four Pigeon Guillemot's, two Common Loons, one Pacific Loon, ten Red-necked Grebes and a Marbled Murrelet were seen offshore from the viewing platform in north Qualicum Beach. 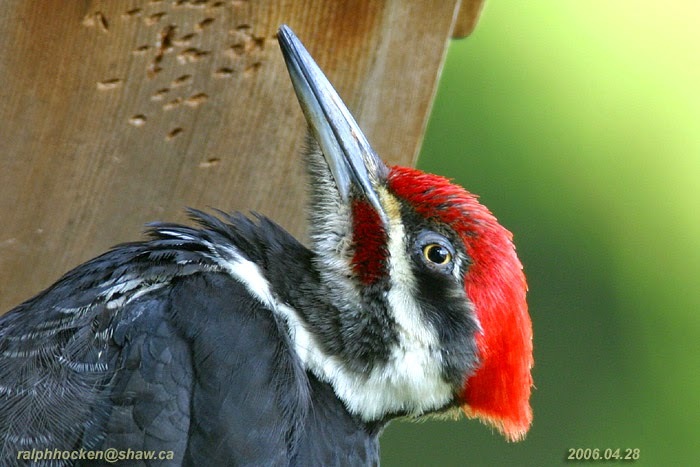 Four Pileated Woodpeckers are feeding on suet feeders in the 5100 block of Broughton Place in Nanaimo. The Tuesday bird walks will resume on Tuesday September 02, 2014. 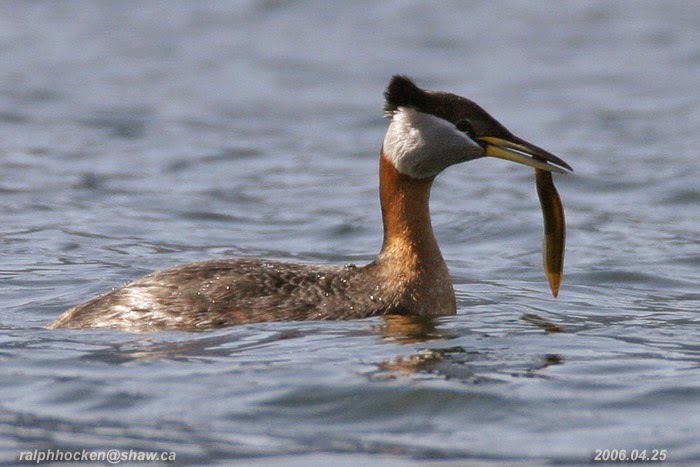 The Sunday bird walk on August 31, 2014 will be going to Buttertubs Marsh in Nanaimo. Meet at the Bird Store at 9:00 a.m. or at the parking lot at Buttertubs March on the Bowen Road side at about 9:20 a.m. The Sunday bird walk went to Linley Valley in Nanaimo. The morning was sunny and warm. Three Pileated Woodpeckers entertained us as they fed along of the trunk of a tree. A female Western Tanager was perched high in a conifer tree. We caught a glimpse of a Wilson’s Warbler near the marsh. Mallard, Wood Duck, Pied-billed Grebe, Great Blue Heron, Turkey Vulture, Merlin, Anna’s Hummingbird, Pileated Woodpecker, Northern Flicker, Common Raven, Northwestern Crow, Wilson’s Warbler, Chestnut-backed Chickadee, Brown Creeper, Red-breasted Nuthatch, Bewick’s Wren, Marsh Wren, Western Tanager, Spotted Towhee, Song Sparrow and American Goldfinch. A Black-Throated Gray Warbler was seen perched in a tree right in front of a 3rd floor balcony, behind the Fire Station in Parksville. 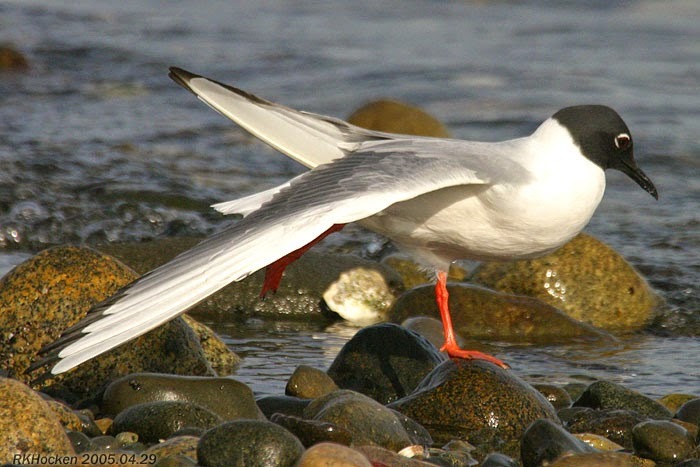 Two Caspian Terns and a pair of Bonaparte Gulls in breeding plumage were seen at Parksville Beach in Parksville. Canada Geese, Mallard, Surf Scoter, White-winged Scoter, Red-necked Grebe, Pelagic Cormorant, Doubled-crested Cormorant, great Blue Heron, Black-bellied Plover, Killdeer, Western Sandpiper, Least Sandpiper, Black Turnstone, Short-billed Dowitcher, California Gull, Bonaparte Gull, Pigeon Guillemot, Eurasian-collared Dove Northern Flicker, Northwester Crow, Common Raven, Purple Martin Red-breasted Nuthatch, Brewer’s Blackbird, White-crowned Sparrow and Song Sparrow were seen along the Plummer Road side of the Englishman River Estuary in Parksville. Bonaparte Gull: Ralph Hocken Photo. Two Common Nighthawks were seen and heard above Meridian Way in Parksville. 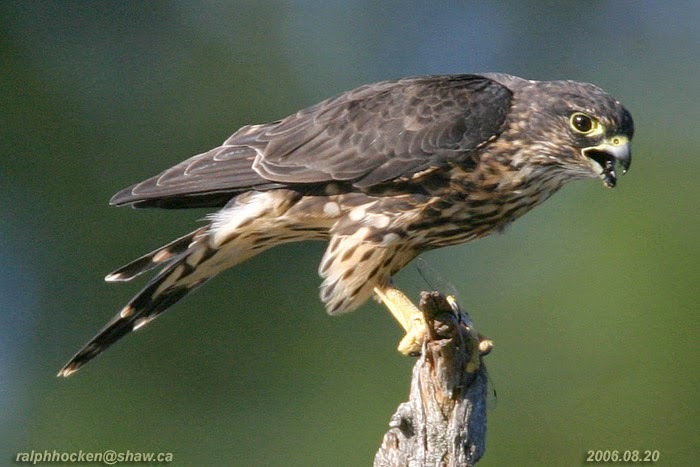 A Sharp shinned hawk was seen in the 2500 block of Glenayr drive in Nanaimo. 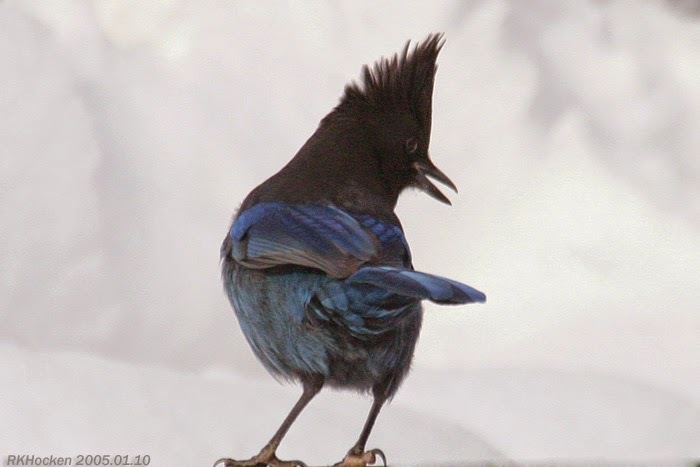 The Sunday bird walk on August 24, 2014 will be going to the Plummer Road side of the Englishman River in Parksville. Meet at the Bird Store at 9:00 a.m. or at the corner of Plummer Road and Shorewood Drive in Parksville at about 9:30 a.m. The Sunday bird walk went to Bowen Park in Nanaimo. The morning was sunny and warm. We spotted a Cooper’s Hawk perched on a branch not far off the trail. A Dark-eyed Junco with a fledgling followed us along the path for a few minutes. 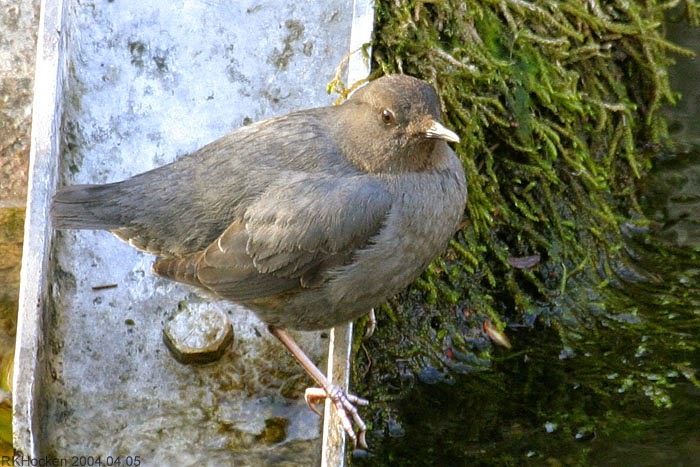 We had great views of an American Dipper feeding in the slow moving Millstream River. Four birders saw and heard the following twenty species:Mallard, Turkey Vulture, Great blue Heron, Cooper’ Hawk, Eurasian Collared Dove, Rock Pigeon, Belted Kingfisher, American Dipper, Anna’s Hummingbird, Northern Flicker, Northwestern Crow, Common Raven, Chestnut-backed Chickadee, Red-breasted Nuthatch, Brown Creeper, Pacific Wren, Bewick's Wren, Dark-eyed Junco, American Robin and Spotted Towhee. A Eurasian Collared Dove stopped in along 5400 Altavista Drive for a bath in the afternoon sun. Eight Common Nighthawks were seen over the Rathtrevor Provincial Park car park in Parksville. 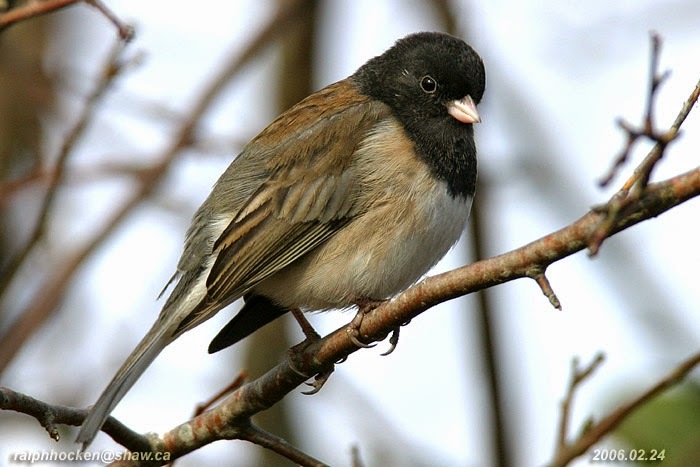 The Sunday bird walk on August 17, 2014 will be going to Linley Valley in Nanaimo. Meet at the Bird Store at 9:00 a.m. or at the end of Burma Road (off Lost Lake Road) at about 9:20 a.m.